Creating Christmas cards with free templates and examples. Drawing Christmas cards has never been easier. Christmas card is a greetings card sent at Christmas. The custom of sending Christmas cards was started in the UK in 1843 by Sir Henry Cole. Since then it is quite popular that people send Christmas cards to express their best wishes for their family and friends at Christmas. Actually, designing Christmas cards could be so much fun. Designing Christmas cards with the help of Christmas card software is quite easy and convenient. 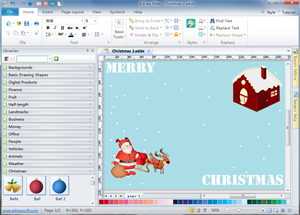 Come and act now to free download the Christmas card software to design your own Christmas cards. Christmas card software is your good assistant to design a Christmas card. Using Christmas card software to make Christmas cards is quite convenient and easy. You definitely should download the Christmas card software to experience the designing process of the Christmas cards. You will surely enjoy designing the Christmas cards yourself if you give the Christmas card software a try. 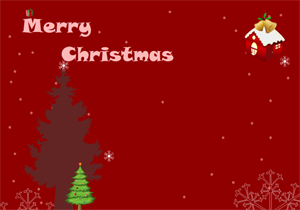 A Christmas card example is presented here allowing users to download and print. You can create personalized Christmas cards with your own messages and photos. 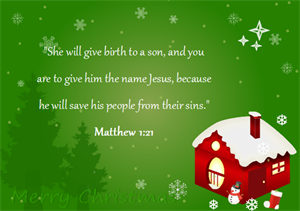 This ready-made Christmas card with Bible verse is available to download. We have prepared more Christmas cards for you to choose and send as E-cards.